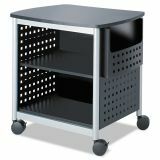 Safco Scoot Printer Stand, 26-1/2w x 20-1/2d x 26-1/2h, Black/Silver - Scoot Printer Stand offers an easy way to free up desk space while keeping essential supplies close at hand. 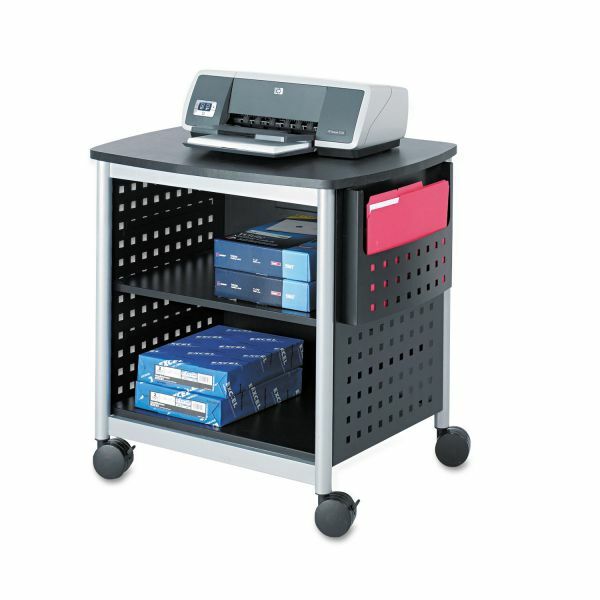 This deskside printer stand is large enough to accommodate most desktop printers and other small office machines. One height-adjustable shelf and adjustable hot file on the side allow easy access to printing supplies. The top shelf holds up to 100 lb. The lower shelves hold up to 50 lb. Printer stand features a unique hole pattern with silver accents. Steel frame has a powder-coat finish and a black laminate top. Stand rolls easily on four dual-wheel casters (two locking).